Description from the publisher: Charlie and Lola star in this brilliant picture book, from Children’s Laureate Lauren Child, to introduce the non-scary nature of counting and sums to very young children. Perfectly funny and perfectly formed, this sees top negotiator Lola take on numbers in everyday life and bend them to her endearing and unique will. 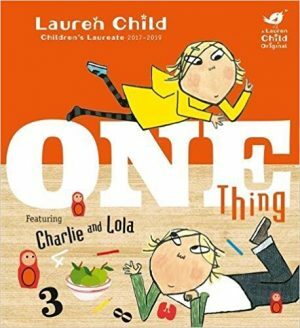 An original Charlie and Lola picture book from the bestselling, multi award-winning author and artist Lauren Child, One Thing is an immediate and enduring classic to delight fans new and old the world over.